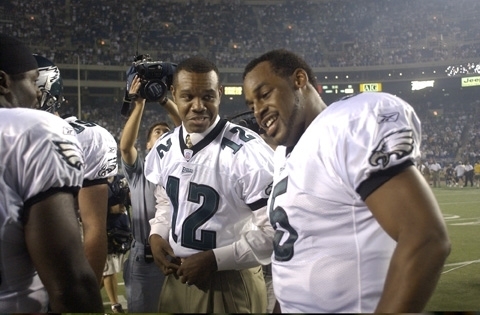 Randall Cunningham, was born on March 27, 1963, in Santa Barbara, California. He attended the Santa Barbara High School as part of graduating class 1981. As a high school senior, Cunningham led his team to a League title and the CIF Finals. After graduating from high school, he attended the University of Nevada in Las Vegas. While playing college football, Cunningham was selected in the second round of the 1985 NFL Draft by the Philadelphia Eagles, with whom he remained through the 1996 season. In his rookie season, Cunningham played sparingly as a reserve to veteran Ron Jaworski, but made a huge impression with his uncanny scrambling ability. When Buddy Ryan arrived in 1986, and took over the coaching of the Philadelphia Eagles, he made massive and unorthodox changes. He designated veteran starter Ron Jaworski at the quarterback position, and replaced him with Cunningham in third-and-long situations where the youngster’s scrambling would presumably put the defence on its heels. When Jaworski suffered a hand injury, Cunningham replaced him as the Eagles’ starter, and was then permanently handed the starting job for the Eagles’ in the 1987 season. Cunningham reached elite status during the 1988 season, after throwing for 407 yards during the “Fog Bowl” playoff game against the Chicago Bears. He was known to occasionally display sensational feats of athleticism, perhaps most notably in a 1988 game against the New York Giants when Cunningham managed to twist his body in mid air, put a hand down for balance while parallel to the ground, regain his footing, and then pass to tight end Jimmie Giles for a touchdown. After major success in the seasons up to 1990, Cunningham’s season came to an abrupt end in 1991 when he sustained a torn anterior cruciate ligament in the first game. After healing completely, however, he returned to the Eagles the following season and led them to their first playoff victory in 12 years. In the 1993 and 1994 season, Cunningham saw foul luck, as he was nagged by a series of injuries and constant changes at the offensive strategy, which eventually led to his benching in favour of veteran Rodney Peete. After feeling that fans and the organisation were less than appreciative of his contributions to the team’s success, Cunningham retired from football after the 1995 season. However, hiatus was brief and Cunningham joined the Vikings in 1997, where in his first year, he orchestrated two late touchdown drives to defeat the New York Giants in an NFC Card game and Giants Stadium. Shortly before the 2000 season, Cunningham signed with the Dallas Cowboys replacing Troy Aikman as quarterback. After being released from the Cowboys, Cunningham signed with the Baltimore Ravens. After seeing very little playing time as backup to Elvis Grbac, Cunningham retired, permanently, after the 2001 season. In his final 10 NFL seasons, Cunningham played in only 80 games, but finished his 16 year career completing 2, 429 of his 4,289 attempts for 29,997 yards and 207 touchdowns, with 134 interceptions. After retirement, Cunningham returned to University of Nevada to complete his college degree, and have been active in the Gospel music business by opening a recording studio and producing a Christian rap group called “Humility.” As a born again Christian, Cunningham became an ordained Protestant minister and founded a church called Remnant Ministries in Las Vegas in 2004. He also coaches youth football in the city for his son.